Hi! 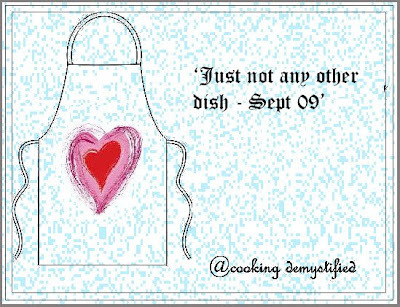 The last few days have been really gloomy, with my younger one not keeping well, I am physically and mentally exhausted. Am just trying to squeeze in a few reposts for the events. I will hopefully be posting something interesting in a few days and if he is in full spirits may be tomorrow, till then see ya. This event is hosted by Hema of Salt to taste and is the brain child of Sharmi of Naivedyam. I am sending Maavinkayi Chutney which was incidentally my first post. 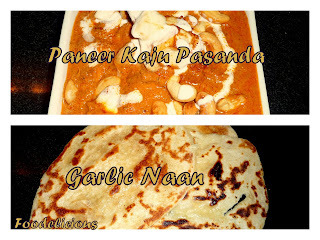 My fist entry is Paneer kaju Pasanda and Garlic Naan which I had made for my kids when they wanted an exotic meal and had relished the meal a lot. The second entry is Bread Butter pudding which again I had made remembering my brother on Rakhi and also to cheer up my kidos. Sending all the above to Kids delight hosted by Srivalli at Spice Your Life to celebrate her blog’s first anniversary. Prefect entries, thanks for sending ur entries to SS..
All the food looks delicious. I hope that your daughter (and you!) feel better soon. Lovely photos! And hope your little one getting better soon! Everything looks so delicious... Where do I start ? perfect entries dear take care of the lilttle one and you too. Perfect entries for the events.. Thanks for sending it to the event Pari! Hope you and your little one are doing well and getting much needed rest. All your foods look so delicious!